A Jeep Wrangler with distinctive markings and an Alberta licence plate disappeared from a parking lot next to a hotel at Halifax’s Stanfield International Airport some time over the last three weeks. A Jeep Wrangler with distinctive markings and an Alberta licence plate was stolen from a parking lot next to a hotel at Halifax's Stanfield International Airport some time over the last three weeks, police said Monday. The theft was discovered when the owner returned to Halifax after being away. 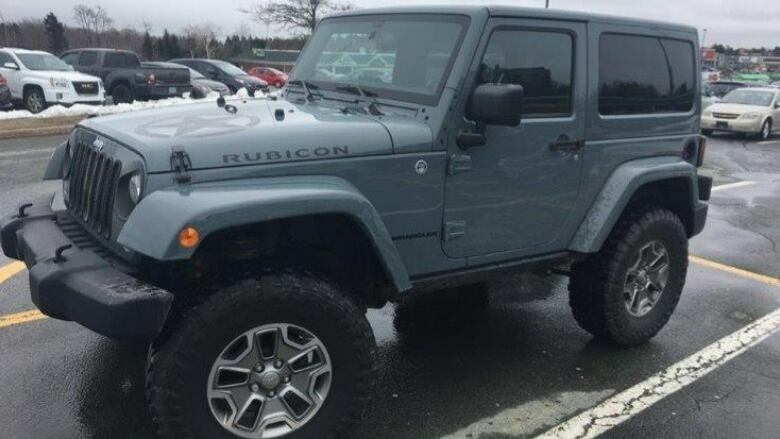 Nova Scotia RCMP said in a release the 2015 Jeep Rubicon was in a lot on Sky Boulevard. The Jeep is grey with a large black star in a circle on the hood and the word Rubicon on the side of the hood. The Alberta licence number is BLN 2559.